Pro Tools is available in 3 versions : HD (for owners of HD cards and interfaces), LE (with Digi003, 003-Rack, Digi002, 002-Rack and MBox et MBox2 series) and M-Powered (for users of M-Audio interfaces). The advantages of this hi-end sequencer rely in its total integration hard+soft, which has led to its success, while being kind of disturbing by its exclusive concept. and disadvantages. We've made this review on a PC laptop (Intel Core 2 Duo 2 GHz, 2 GB Ram) and an external FireWire HD. If you've planned to buy a Pro Tools system, have a look on the DUC (Digidesign User Conference) before everything. Here you'll find precious advice, as there's a lot of computer configurations that are incompatible with Pro Tools. Thus you'll not loose your time or money. Pro Tools LE is very close to Pro Tools HD, and both are supposed to sound similar. Of course audio cards and converters of the respective systems aren't playing in the same league. But except these obvious disimilarities, what are the other differences? Firstly, HD mixer operates in 48-bit fixed point (24 x 2) where LE's is on 32-bit floating point. It makes some differences when mixing. Then HD has an unlimited number of tracks, LE only has 32 (48 with the Music Production Toolkit or DV Toolkit 2 bundles). HD has access to TDM and HTDM plug-ins (powered by the DSP of HD and Accel cards), on top of RTAS and AudioSuite plugs, and benefit from a zero latency path, fully compensated even on the I/O to external hardware. The HD has also extended post-production capabilities (for LE, they are for the most part available with the expensive DV Toolkit 2 bundle) and manage video options, top of the range consoles and has incomparable networking capabilities. Admittedly, there are numerous differences. The biggest one being the price... All these versions are compatible with each other and cross-platform too. We won't detail all the updates differences between HD and LE, except that the HD system benefit from specific evolutions for Media Station, D-Control, D-Command and HD Sync. The main update is Elastic Audio. OK, what's Elastic Audio? And why its concept is it claimed as new when ACID files are perfectly integrated in Sonar, Apple Loops in Soundtrack/Garage Band/Logic or Warp Markers in Live? Well, ET/EA uses exactly the same principles, but Digidesign says the quality is way over the competitors. Precisely that kind of sophistication in sound which gives its sound to Live, its specificity (in every sense of the word). 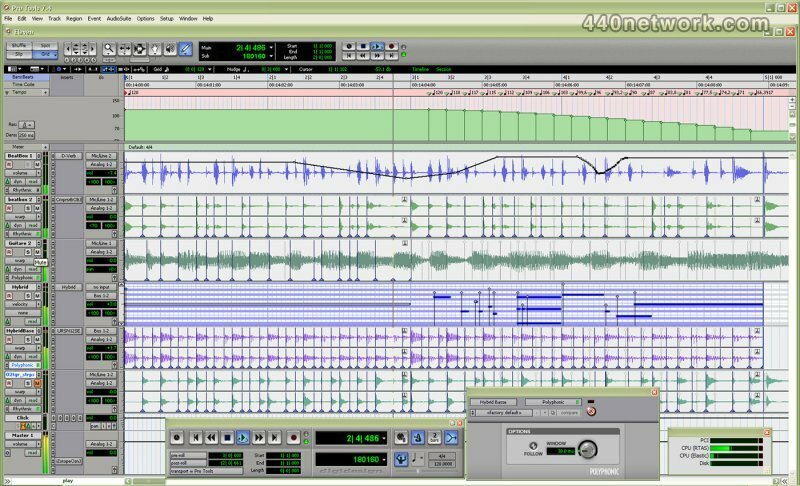 Digi aim is to make Pro Tools 7.4 the leader DAW in terms of time stretch quality and capability; because if there has been a great quality advance between the "old" Pitch Shift and the awesome and alas not free X-Form (based on Izotope Radius algorithm), a good solution was still missing in order to complement the excellent Beat Detective. With Pro Tools 7, ACID and REX files support was added, but the possibilities were disappointing: you can import loops, but they were just sliced according to the meta information included. No time stretch or automatic crossfades. Hence when you changed the tempo, overlapping or silence between the slices always occur. This time, Digi promises great things, and not only for ACID and REX: WAV, AIFF, BWF are supported, as well as MP3 and SDII if they are imported in the session before any change - then Pro Tools convert them in WAV or AIFF. We've asked for real time? Let's go for an Elastic session! Before testing Elastic Audio, we'll change all the tracks management to Ticks rather than Samples, a preference we can modify at any time. Why Ticks ? Because, and even if they aren't as precise as samples, they will follow MIDI timing rather than time, on a 960 ticks by quarter note basis instead of 48000 samples per second. Then our audio loops, with the help of quantization if needed, will follow the tempo! Note that this change is not mandatory, but we are testing Elastic Audio, aren't we? Then you move the file directly within the session, or in the Region List on your right. If the session is empty, a pop-up window will ask us if we want to import the file's tempo. Once the file is imported, an icon signals the activation of ET/EA in the Arrange window as well as in the Region List, where two versions of the file now co-exist: the original and the realtime stretched version, the Elastic file. If you change the tempo, the file immediately follows the changes and sound quality is awesome! There's only one problem: the file doesn't perfectly loop. No problem, we'll quantize it! First we'll use the new Analysis viewing mode, zoom and verify that Warp Markers are correctly set, as we'd do in Beat Detective. You can move these markers, create new with a double-click and delete them with Alt-clic. Once the markers are OK, we open the Quantization window (Event – Event Operation – Quantize), we choose the desired groove and it's done! Pro Tools goes way further than Live, even if the Ableton soft has been a great source of inspiration for the Digi developers. Above all when you realize that quantization also works on "non-elastic" files (files that have not been analyzed), as long as they're sliced! Efficient and fiendishly simple. Firstly, Pro Tools 7.4 offers an ameliorated transient detection algorithm, in mono, rhythmic and poly modes. It works extremely fine with almost any audio material, and it doesn't need a lot of fits. An Elastic Properties window is available in the Regions menu and here this is real luxury: ytou can modify the tempo, metric and musical length of a selection, double or divide in two the tempo, as often as needed (just like in Live...), modify its gain and finally the Event Sensitivity, to adjust the number of Warp Markers ! Lastly the X-Form mode, stemming from the AudioSuite plug-in of the same name, est probably the best mode here, but doesn't work in real time and needs long calculations. It offers a quality setting (Low or Max) and an optional formant handling, ensuring incredibly good results. So, all this time stretch process is a copy of Live, without granular functions and with a way better sound. We also have to say that ACID and REX files are perfectly handled. You can either work in real time (except with X-Form) or off-line to free CPU ressources. Real time processing does exactly what it means and you'll easily forget that there's some background tasks while working as usual on a session. Offline processing can be a bit long but can be really helpful when your session is already CPU hungry (the temporary files will then be stored in a new directory, Rendered Files) and it offers best results, thanks to the X-Form mode. When you remove Elastic Audio from a track, a window offers to save the modified files, including Fades (Commit) and to automatically replace the whole track with the resulting files. Playlists will also be changed. Elastic Audio settings are availble for a whole track, i.e all the regions on a track. So to make some variations, you have to create a new track; in that case, when using LE, the 48 tracks capability offered by the bundles is really welcome. On top of the Analysis viewing mode, very useful for quantizing audio, there's a Warp viewing mode designed for manual quantization. You'll find 3 kind of markers: the Event Markers, in grey, point out the audio events and can only be moved, created or removed in Analysis viewing mode. Then the Warp Markers, with a little triangle on their lower end, position the audio on the grid, the same way Live do. You can create, move and remove them as required. Finally the Tempo Event-Generated Warp Markers, point out a tempo change and have a lozenge on their upper end. As for Warping, there's three ways to do it: télescopic, accordion-like and by selection. Now let's come back on that last point. Telescopic Warping was made among other things to sync a whole song on our session's tempo manually, knowing that the Conform to Tempo option sometimes allows you to do it automatically. Let's say you create a unique Warp Marker on the first beat of the track, and move that marker on a point of the grid (the beginning of a bar, most of the time). Then everything becomes just simple: you can take for instance the Event Marker situated on the first beat 4 bars away, drag it on its equivalent on the session's grid and the whole song will get in sync at once. The first beat only won't move, a little like Acid does, but in a better way. Finally the Range Warping works between two Markers, like in Ableton Live : you may put a third Marker there and move it at will, which will stretch the sound on one side of that point and stretch it on the other. On or off the grid. Watch out now, as you also may apply this process to a whole selection, which will keep it as is but will warp everything around. Ideal in order to modify rhythmic sections or create special effects. These might sound less characteristic than they would in Live though, that is less predictable and often less musical because of… their greater quality! Obviously you can't have everything at the same time. Also notice that extreme tweaking might overload your CPU very quickly, so the Rendered mode will often be needed. But to have that in Pro Tools, what a slap! Beat box 1, same tempo but quantized in Rythmic mode. Beat box 1, same tempo. Rythmic effects done with Range Warp. Beat box 2, tempo set to 102 BPM and not really square. Beat box 2, quantized in Rythmic mode. The tempo is now 120 BPM. Electric Guitar with saturation (Eleven plug-in), same tempo but moved closer to the grid in Polyphonic mode. A first mix with the Beat boxes 1 and 2, the saturated guitar, a rhythmic base made with the Hybrid synth and the beginning of a techno track stretched from 135 to 120 BPM thanks to the Telescopic Warp. Same thing with an also absurd movement from 120 to 180 BPM. The result is ok, except for the musicality! Same thing with jumps from 120 to 90, and finally 150 BPM. With a range of 30 BPM the result is really ok, even good compared to almost anything else. All these modifications of Pro Tools core concept lead of course to unavoidable questions. Thus, when using AudioSuite effects the elastic region is rendered first, the AudioSuite is applied and the newly obtained region is analysed again. Same thing for the complex problem given by fades and crossfades, so important in Pro Tools and so inexistent in Ableton Live since its beginnings – now guess why! Indeed Time Stretch, and whatever algorithm is used, modifies the waveform in such a way that you can generally not recreate a fade on the basis of its original duration and have the same effect. And it is worse for crossfades, as they work on different regions at the same time… Therefore we'll apply them at the very end of the job, once all the elastic manipulations will be over. Of course, all of this makes the whole thing quite complicated to deal with, but it also explains why Ableton never tried to put fades in its program. Something more problematic now: the documentation informs us that what we see on the screen might not reflect reality, as real-time Elastic Audio leads to at least visual approximations (really?). Hence some eventual surprises, and the use of invisible microfades (around 1.5 ms) between regions whose beginning and/or end might fluctuate. This is not so reassuring, and shows some imprecision in the process as well. Clips can also happen in between elastic regions, and Digi's advice is then to lower the gain beforehand. Finally automation won't follow the Warping. Therefore we'll be well advised to proceed in a fixed order during our next sessions: we will record, work with Elastic Audio and only then apply fades, crossfades and automation, knowing that going back to the elastic part of the work will require a lot of meticulousness if we don't want to forget anything! Finally there are a numerous evolutions concerning the use of video, which was not so handy until now unless you had an HD or at least the DV Toolkit 2 option for the LE version. First Pro Tools LE is compatible with Avid. Then with an Avid Mojo SDI you'll be allowed to put different video files in a same track, with different codecs, use Playlists, insert spaces between videos, do some basic editing, etc. Just something normal for any other sequencer, except that here you need to get an Avid Mojo SDI first. At a Digi usual price... Note also that the DigiTranslator 2 option is now available for the M-Powered option. Still Elastic Audio is a huge thing for the quality of its algorithms and the enhanced transient detection, the X-Form and VariSpeed modes, the audio quantification, the real-time and/or rendered workflow, the new Warp and Analysis track views, etc. And it'll sure take some time to digest all of this, for us and for our processors as well! Of course there are also some criticisms: there's no pitch shifting function to match the new ones we have for time stretching, we have to deal with a whole lot of small approximations and complications (for elastic waveforms, fades and clips), there are still only 32 undos for the LE version and they don't work for everything, the latency compensation is still unclear and partial in Pro Tools LE, we still miss a Freeze function, all the plug-ins have to be downloaded again and the Options (DigiTranslator, Music Production Toolkit and DV ToolKit 2) are still very expensive, without speaking about the MP3 export. But hell we won't complain, as for once Digidesign went further away than its competitors! Sony and Ableton should worry a little by now… This update is more than essential. Pro Tools LE and Pro Tools HD are Digidesign products.